The main character of the book is Mr. David Ponder, a wealthy real estate developer in Dallas. He is committed to building a skyscraper without borrowing money. People don’t believe that it is possible, but he declares that he will pay as he goes. His life is not walk in the park, because he declares bankruptcy at age 55. But he believes that adversity is preparation for greatness. He uses the Seven Decisions as a guide for the way he lives his life. What’s interesting about this book is the concept of travelers. Mr. Ponder is one of the travelers who travels to meet some of the great people like President Truman. The author was able to put events that happened from multiple time periods into one setting, which provides a historical perspective and a good blend of exchange of conversation that would otherwise not be possible in our current setting. My favorite part of the book is when David Ponder, Winston Churchill, Joan of Arc, Eric Erickson, and Abraham Lincoln are discussing the possible solution to the question: What must humanity do, individually and collectively, to restore itself to the pathway toward successful civilization? They have four chances to answer the question and save humanity. The quality of one’s answer greatly depends on the quality of the question asked. Reading this book is like peeling an onion; the more I read the more I became interested in it. Eventually it became impossible to put it down until I found out the outcome of the journey. The creativity that was put into writing this book is amazing. As I read it, I could imagine the characters interacting with one another. I highly recommend this book to people who want to take a peek into the past and also learn how the Seven Decisions can help change their life. 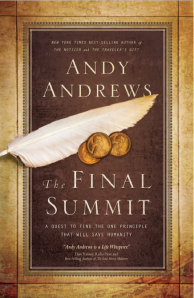 To learn more about the book, please visit The Final Summit. You can also follow Andy Andrews on Twitter (@AndyAndrews). Interesting premise. I’ve added it to my book list. I read a book called The Book Thief, in which the narrator was Death. Another interesting way to weave a story between different timelines. Great book BTW.